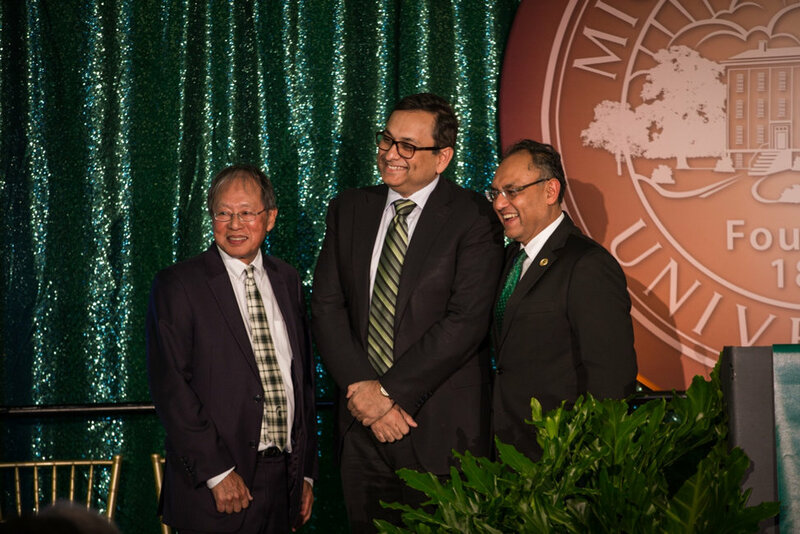 Austin, Texas Nov.14, 2018 – Michigan State University (MSU) officials announced a $1 million gift to the Eli Broad College of Business from alumnus Manoj Saxena, executive chairman of CognitiveScale and founding director of the Saxena Family Foundation. The gift will establish the Omura-Saxena Endowed Professorship to permanently support a faculty position in Responsible Artificial Intelligence (AI). The professorship honors Glenn S. Omura, a leading expert and professor at the Broad College’s Department of Marketing and the recently retired associate dean for MBA and master’s programs. Omura is widely recognized for his work on market creation and entrepreneurial marketing, particularly those driven by emerging technologies. According to economic projections, AI will increase the global gross domestic product by 14 percent, or an additional $15.7 trillion by in 2030, making it the biggest commercial opportunity in today’s economy. Harnessing AI in the coming years requires the creation of a workforce that has the skills and understanding needed to build and manage AI systems that are secure, transparent, explainable and accountable, so that we can avoid unintended consequences that can be harmful to individuals, businesses, and society, according to the Saxena foundation. Saxena earned his MBA from MSU in 1991 and has since worked as a serial entrepreneur, an IBM executive, a venture capitalist, a Federal Reserve Board member, and philanthropist. While at IBM, Saxena served as the first general manager of IBM Watson, where his team built the first cognitive systems. Prior to IBM, Saxena successfully founded and sold two venture-backed software companies within a five-year span. CognitiveScale, a leader in Augmented Intelligence and Responsible AI, will provide expertise, technology support and internship opportunities to accelerate MSU’s efforts in this area. The Eli Broad College of Business has earned accolades as a global research institution focused on instilling an entrepreneurial, global, and ethical mindset in students. Omura’s work at MSU has centered on creating and growing markets, entrepreneurial marketing and brand strategy, as well as building immersive learning experiences in the Broad MBA program. The Saxena Family Foundation was established in 2002 by the technology entrepreneur and venture capitalist Manoj Saxena. Mr. Saxena and his family believe in “doing well by doing good” and founded the charity to focus on initiatives that promote empowerment of women and at-risk children so that they have equal rights and opportunities later in life. CognitiveScale’s Augmented Intelligence software helps businesses apply Artificial Intelligence and Blockchain technology to solve complex business problems at scale for financial services, healthcare, and digital commerce markets. The company’s award-winning software is being used by global leaders such as USAA, Morgan Stanley, NBC, JPMorgan Chase, ExxonMobil, and MD Anderson to increase user engagement, improve decision-making, and deploy self-learning and self-assuring business processes. Headquartered in Austin, Texas, CognitiveScale has offices in New York, London and Hyderabad, India, and is funded by Norwest Venture Partners, Intel Capital, IBM Watson, M12, and USAA among others. For more information on the company, please visit cognitivescale.com and follow @cognitivescale on Twitter, Facebook and LinkedIn.